Joe Sakic, one of the most respected captains and players in NHL history retired today. 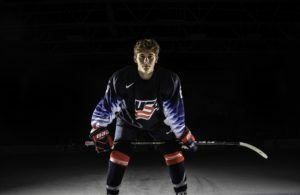 Playing in the NHL is a dream just about every hockey player has since they were 8-years old. 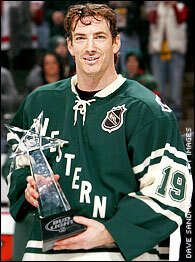 For those who are fortunate and skilled enough to make it to the league wishes they have the 20-year career Sakic had. Growing up a Detroit Red Wings fan, I’ve had a natural hate and distaste for the Colorado Avalanche. But one of the players I couldn’t really hate but respected was Joe. He to fans in Denver was what Steve Yzerman was to us in Detroit. Strangely enough, both wore the No. 19. He was one of the great leaders and scorers in the NHL. In his career, he was fortunate to win the Stanley Cup in 1996 and 2001. In terms of raw numbers, he’s eighth in points (1,641), 11th in assists (1,016) and 14th in goals (625). I can promise you he will be a first ballot Hall-of-Famer when he becomes eligible in 2012. Denver’s No. 19 will be raised to the Pepsi Center rafters in the season opener for the Av’s, which is truly deserved. He will become the third Avalanche player to have their number retired, joining Patrick Roy and Ray Bourque. A 13-time NHL All-Star, Sakic has an NHL-record eight playoff overtime goals and wore the captain’s “C” for 16 seasons, which places him second behind Yzerman’s 20 seasons in terms of longest serving captains in NHL history.